Whether it’s your 1st or 50th album there’s mistakes you should avoid at all costs when recording. 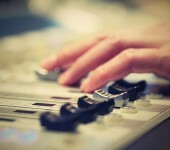 Below are some of the most common mistakes to avoid in order to produce an album your fans will want to keep on replay. If you think those solid distortion sounds and crunch tones you hear on your favorite albums came from a $20 distortion pedal, you’re wrong. If you’re looking for legit natural overdrive, try plugging in a tube amp and connecting it to your guitar. This will clean up the guitar tone, and really give your band a more professional sound blowing out the speaker. Musicians who are aware of their strengths and weaknesses have the ability to try and be something there not. Working on your weakness is much more time consuming, making the most of your strengths will be a lot more beneficial to your album and, other band members. A successful band is a business, and without a business plan you’ve got nothing but an unorganized, discombobulated, mess. When you’re setting out to record an album a plan should be set in place including amount of time alotted, rehearsal studio time and location, what tracks will be covered and a list of materials to show up with. Before recording an album it’s best practice to familiarize yourself with the environment. After you choose the right rehearsal space it helps to practice there and get fully acquainted with the studio. Most would assume if you’re recording an album with your band they’ve already performed live, this is not always the case. Playing in front of a live audience will allow you to feel the energy and learn what works best for your fans. True performers can pick up on this sort of energy and it will certainly teach you the most engaging parts of your songs. Part of the recording plan mentioned above should include instrument preparation such as tuning your guitar, testing the mics, checking the amps and making sure the singers have warmed up.